An Intha fishing boat in Myanmar. As Myanmar’s military junta cracked down on protesting monks over a year ago, the regime tried to limit the flow of information from the country. The authoritarian government also strictly controls travel to and from the country. David Kootnikoff is a citizen journalist who writes at OhMyNews about visiting the small fishing village of Nyuangshwe, where he tries to get a sense of the reality of daily life in Myanmar. When Soe hears my wife is Japanese he quietly apologizes. During the 2007 anti-government protests in Burma one of his fellow compatriots – a young soldier in flip-flops – shot and killed Japanese photographer, Kenji Nagai, at point blank range in the heart of Rangoon. We’ve just arrived in the village of Nyuangshwe on the shore of Inle Lake about 400 kilometers north of Rangoon. Soe (not his real name) had seen the protests on the BBC at a teahouse in town and watched in horror as Nagai collapsed in front of the soldier. The junta, bearing the Orwellian moniker the State Peace and Development Council (SPDC), had forgotten to cut the country’s satellite and Internet connections. “No one supports the government – everybody hates them,” Soe says under his breath. As we soon discover, it’s a familiar refrain. Deciding whether or not to travel into Burma, a nation of 50 million, wasn’t easy. Nobel Peace laureate Aung San Suu Kyi has recommended tourists stay away until “genuine progress towards democratization” is made, while others such as Thant Myint-U, an historian and grandson of former United Nations Secretary General U Thant, argue for engagement. Another issue is what to call the country. The SPDC unilaterally changed the name in 1989 from Burma to Myanmar without consulting its citizens. Most opposition groups use Burma, as do some governments such as the U.S. and Canada, while the United Nations recognizes Myanmar. The next morning Soe takes us out on the lake as the damp air seeps into our clothes and a lone bird from the surrounding marshes breaks the silence. Nestled between two mountain ranges in Shan state, Inle seems far removed from the catastrophe of Cyclone Nargis, which devastated the country last spring. 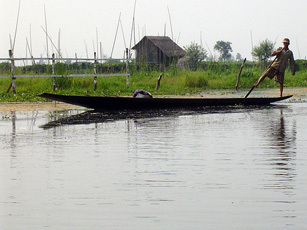 Inle is home to the Intha, one of Burma’s more than 130 ethnic groups. They live in homes built on stilts that balance precariously above the lake’s surface like giant long-legged spiders. For sustenance they fish and farm floating gardens attached to the shallow lake bottom by bamboo poles. Photo courtesy of Flickr user flappingwings under a Creative Commons license.